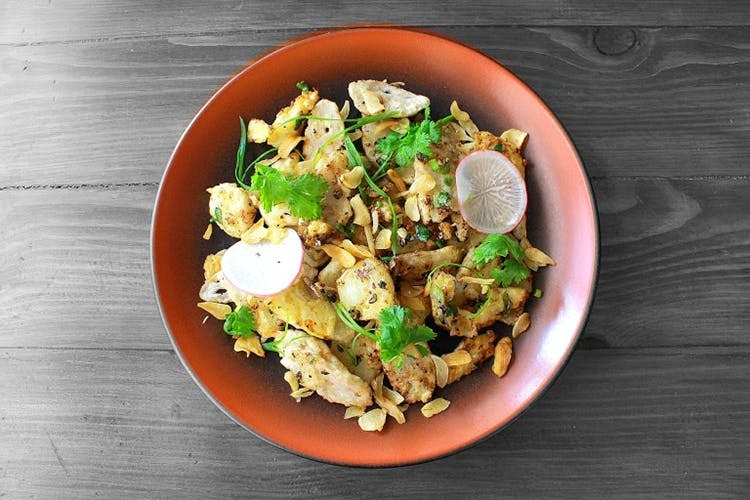 The baby of Chef Surajit Ghara, OKI, is really the short of Oriental Kitchen (O and Ki), and is dishing out pan-Asian food with a smattering of European fare. Located on a relatively quiet lane in the heavily residential Kamanahalli area, the decor like the cuisine, is a mix of the Oriental in the short bamboo partitions, red paint, and framed wall art and a touch of Europe in the wood and metal grill work. Opt to sit at heavy wooden tables and chairs, benches, more intimate smaller tables and chairs or even the family sized sofas that are placed in an elevated section of the space. Plus, books, colouring material and games for kids and adults. Aiming to offer a variety of dishes with affordable dining, Oki strives to maintain a mix of styles with a reasonable price point. Pizzas, pastas and fritters exist alongside dim sums, satays, wontons and baos. Their menu breaks the mould from the usual divisions like starters, soups, mains etc and is sectioned instead, under labels like Small Eats, Hearty Choice, Meal In Itself and such. Traditional dishes have been given a modern makeover. Local flavours include Ragi Dim Sum and Mushroom Millet Pierogi. I tried the veg dim sum platter and the stuffed mushrooms with ricotta, both of which are a must try for vegetarians. There is a non-vegetarian option with prawn, fish and chicken, but the casing was a tad too thick. The Duck wonton soup — wontons stuffed with duck mince, swimming in a dark broth along with tender sliced duck meat, was a delightful start to the meal. This was followed by the Crispy lotus root, water chestnuts and bamboo shoot and with all three of my favorite ingredients in one dish, what was not to love ? Seafood made an appearance in the form of delicious Crab Cakes, enhanced by the accompanying sauce — a super smoky onion remoulade topped with crispy fried onion sticks. I opted to taste the Tender pork ribs with chilli mango jam and sauteed vegetables. This was done to perfection, and the home made mango jam the ideal accompaniment. The Blueberry camomile martini and the Apple cider tom yum, were my choices from the mocktail bar. I found both drinks a bit too intense for my palate and I had them diluted with soda, after which they turned out perfect. Dessert is not to be missed. I asked for my all time favorite flavors of Tender coconut ice cream with water chestnut rubies and longan. This post first appeared on Currylines. Read the original here.